Starbucks Corporation (NASDAQ:SBUX) is in the hot seat this morning. Headlines of a viral video of two men getting arrested is causing downside pressure in Starbucks stock. The equity markets general are already nervous. We fell into a correction early February and the effects of that linger in the headlines. But the trouble for Starbucks stock started about a week earlier than that when it reported earnings. Wall Street did not like whatever management had to say. SBUX stock fell 10% on the headline news and on heavy volume. So by the time the market wide correction hit, Starbucks stock had already shed a lot of its froth on the earnings report headline. So it bounced hard off of a triple bottom and rallied all the way to $60-per-share twice since then and therein lies the opportunity. If SBUX can break $62-per-share, it can trigger a technical buying signal with a target price that is $6 higher. It is likely that the most recent video will cause some down south pressure for the next few days at least. But in the long-term, the stock fundamentals will prevail causing another bounce to challenge the technical opportunity that lies ahead for SBUX the next few weeks. When the stock recovers, it will rally toward a descending trend line that if the Bulls can breach, they will be able to overshoot and challenge for a new high. Even though the upside technical potential is exciting and is supported by solid fundamentals, I more strongly believe in the downside support that lies below. The Starbucks stock spent the last two years consolidating above $54-per-share and that usually creates a solid base for a higher trading plateau. SBUX has firm footing and can mount rally to finally set a new high above $65-per-share. This won’t be easy, but I believe the SBUX fundamentals and the management team are up to the task. Starbucks stock will need the help of favorable macroeconomic conditions. In other words, it will not rally if the stock market is falling. To that, I still favor a bullish thesis for the remainder of 2018 in spite of the inflammatory headlines that litter the current ticker tape. Without scary headlines, the bear thesis at this point is thin. We have global growth and U.S. tax advantages and those will prevail over fears of rising rates. Geopolitical worries will abate as they always do; cooler heads will prevail. For the trade here, I do not require a rally to profit. I merely need SBUX stock to hold above recent support for me to retain my maximum games. But if I’m wrong, the worst that could happen is that I own shares at a deep discount from current levels. Over the long-term, I am confident that this would not be a mistake. Analysts agree as their opinions are split between Buy and Hold, and the stock price is trading toward the lower end of their price range. This lessens the likelihood of a deluge of downgrades since they are not overzealous about it right now. The Trade: Sell the SBUX SEP $50 naked put. This is a bullish trade where I collect 80 cents to open. Here I have a 85% theoretical chance of success. But if the price falls below my strike, then I accrue losses below $49.20. The Alternate Bet: Sell the SBUX SEP $50/$45 bull put spread, which has about the same odds of winning and would yield 10% on risk. Compare this with risking $59 per share here and without any room for error expect a rally profit. 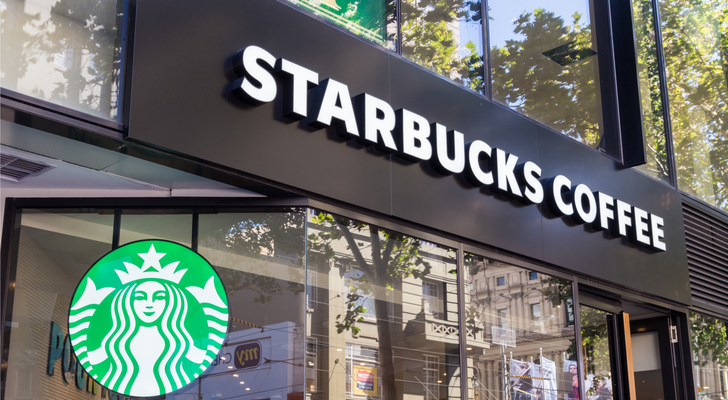 Article printed from InvestorPlace Media, https://investorplace.com/2018/04/starbucks-corporation-stock-is-a-strong-bet-ahead-of-earnings/.